I’m a Pinterest fangirl through and through. I scoured the Pinterest feed for hours upon hours when I was planning my wedding, having a baby, and starting my business. It led me to so many amazing ideas and blogs that I never would’ve known about otherwise. 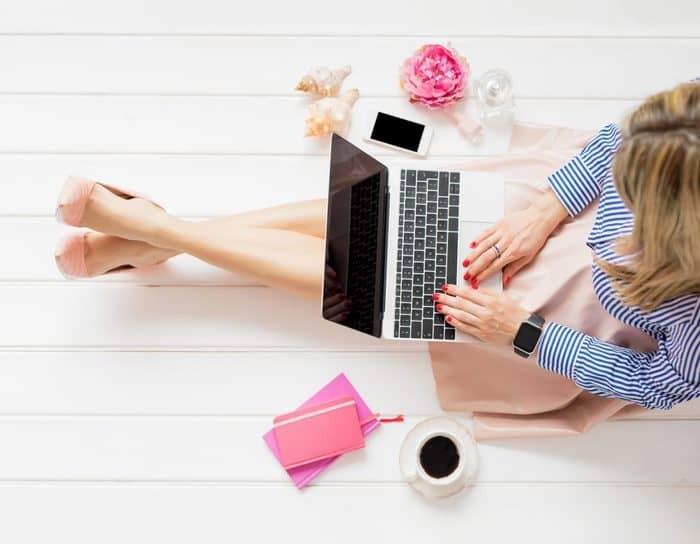 If you’re not familiar with using Pinterest for your business, I’m going to let you in on some classified info right now >>> Pinterest is the best free resource for driving traffic to your blog and helping you to grow your biz. If you’re new to Pinterest, then let me give you a little rundown on how this whole thing works. People search for things they need, and Pinterest brings up various pins related to their inquiry. Those pins often lead back to blog posts that provide solutions for the things they were searching for. If you’re a blogger, how awesome would it be if YOUR blog post popped up in the Pinterest feed when someone is searching for a solution to something? Example: let’s say you’re a wedding blogger and you have a blog post about rustic wedding inspiration. When someone is searching for rustic wedding ideas on Pinterest, your blog post pops up and leads them back to your website. Now you have a new reader and a potential follower/client. Boom-baby! If you want to gain blog traffic and loyal readers from Pinterest, you need to do a few basic things. You need to set up a Pinterest business account, enable rich pins, create attractive pinnable images, and share those images on Pinterest. This is the only way for people to FIND your blog posts on Pinterest. If you want your pins (and your blog posts) to reach a wider audience, you also need to get OTHER PEOPLE to share your pins too. How do you get other people to share your pins with their audience? 1.You scatter pins all over the Pinterest feed, using SEO, group boards, and Tailwind Tribes. This way, people can find your pins and repin them to their own boards. Don’t be spammy, but share fres new content on a regular basis! 2.You can place shareable pin images in your blog posts, so that people can save your pins to their Pinterest board directly from your website. The best way to make your blog posts extra-super-duper shareable on Pinterest is to create several pins for each blog post and place them within your blog posts so that people can save your blog post for later. This also gives YOU several pin options for each blog post, which helps with split testing. WHY HIDE PIN IMAGES IN YOUR BLOG POSTS? Every blog article that you write should have a Pinterest-friendly image somewhere in there. That way, if someone wants to save that article for later or share that article on Pinterest, they have a pinnable image to go along with it. 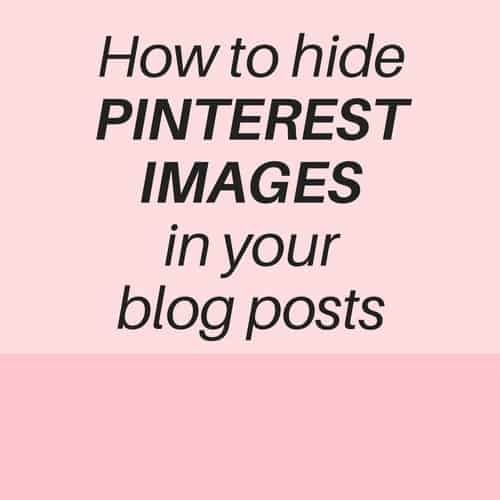 You can’t share blog articles on Pinterest without a pin image, so if you want your readers to share your stuff on Pinterest, you need pin images in your blog posts. I create my Pinterest graphics in Canva. It’s free and easy to create them, and they have a specific template that is the perfect size for Pinterest pins. I create 2-3 Pinterest graphics for every single blog post. Why would you want to hide pin images in your blog posts? The best performing Pinterest graphics are vertical images, meaning they are long images that take up a lot of space in your blog posts. How annoying is it when you have to scroll past a bunch of images just to read something? It’s super annoying. Even if you put your 2-3 pin images at the end of your article, it’s still a cluttered and distracting mess. Yes, I’m the typical TYPE A girl that likes me blog articles to look CLEAN and ORGANIZED. Multiple pin images is great for split-testing. I use a few different colors, images, and fonts when I create my pin images. When you go into your Pinterest account and check your analytics, you’ll be able to see which pins are performing well. MAKE MORE OF THOSE! Your readers are telling you what they want from you. Listen to them. And it’s actually super easy to hide pin images in your blog posts, once you know what to do. Download the WPtasty plugin. This plugin allows you to optimize and hide multiple pins in your blog post with just a few clicks. First, you’ll download the plugin here. It will be one of the best $29 investments you’ll ever make, I promise. Then, activate the plugin in your WordPress dashboard. Click on “Select Images” and then upload and select the pin images that you want to hide in this post. To select more than one image, just hold down the CTRL key and click on every pin that you want to upload to that post. And that’s it! Save your work, and you now have optimized hidden pins in your blog posts. Go into your latest blog post, scroll to the bottom, and click on the TEXT tab in the top right. It looks like this. At the very bottom of your blog post, after all of the text, you are going to type this code. It is super important that you type it out, by hand, exactly as you see it here. It is important that this code comes AFTER any text in your blog post, but BEFORE the images that you want to hide. Again, it is super important that you type these words and symbols out by hand. If you try to copy/paste, you will more than likely deal with errors (I learned this the hard way)! Everything that sits between these two codes will be hidden from your reader’s view! To make the process easier for either of these options, you’ll want to have several pin images in your media library in your WordPress dashboard. Create your pin images, download them to your computer, and then upload them to your media library in WordPress. Boom, baby! Let’s say that you followed my steps exactly and it didn’t work. Your pin images are still showing up on the text tab. Type it out every time, don’t copy and paste. Switch to Visual View in the editor and then back to Text View and make sure that WordPress didn’t mysteriously add an extra set of quote marks between your equal sign and your opening quotation marks in the first string of code. If there are two sets of quotes, like this, then remove one of them, and preview it again: <div style= “”display: none;”> That extra quote mark after the equal sign is NO BUENO. Let’s wrap it up like a rolled taco and make sure that everyone walks away with the important message: Pinterest rocks and you should be using it for your blog. You should be making multiple pin images for every blog post and using them to split-test what gets the most repins. And you can hide several pins at the end of your blog posts to keep your blog posts clean and organized and give yourself and your reader several options for pinning your content. Did you enjoy this article?! Please share with your fellow bloggers to save them the hassle of learning this trick the hard way! I wonder if my copy/paste is the reason its glitching in Gutenberg??? I’ll have to give it another try! I’m not using Gutenberg yet but I notice anytime I did copy/paste, it always messed up my coding. OMG! Earlier I had told you that I was trying to do it your way, and it was not working, so I did a post, where I tried it again, and it FINALLY WORKED!!! Thanks! You’ll add the images to your blog through the “add media” button in WordPress. You create your own pin images (through software like Canva or Photoshop), download them onto your computer, and then upload them to your blog. Great post! Thank you for sharing. I have been racking my brain trying to figure this out! Super helpful!! Really helpful post, Cate-thanks! A question though: does it slow down the page loading if there are additional images hidden in this way? This is such a great idea! I have tried putting multiple pin images at the bottom of the post and I really didn’t like how it looked. I will definitely put WPtasty on my list of future blog investments and take advantage of the free option right now. Thank you for sharing these awesome tips! Sorry, I’m just seeing this comment right now. Hiding pins allows you to create several pin images for each blog post and then pin those pins at different times. If you have a pinning plugin then those hidden pins will pop up when people go to save your post, and then they can choose which pin they’d like to save. It gives YOU options to pin a variety of pins for the same post, and gives your readers options.